After a successful first edition last May 2018, we are very happy to announce that Dali Flow Fest is coming back in the end of April 2019. Dali Flow Fest is a non commercial and self financed event. Initiated by Fire Nomads, a French Chinese couple living in Dali, they made this dream come true thanks to the help of Dali community and 20 international artists that for many came on their own expenses (check last year‘s line-up). Our purpose is to spread in Dali (a small historical town in Chinese himalayas) the spirit of juggling and flow arts conventions, in a beautiful outdoor and indoor combined venue with the sweetest weather the year can offer in this part of the world. All day workshops, theme nights, fire circle, eclectic musical program, camping, kitchen and bar, trying our best to use local products and be environmental friendly . It’s also an opportunity to experience Chinese culture around a common interest : Flow arts and Juggling. Master classes and speeches on juggling and performance will be proposed by international jugglers and flow artists. All participants are welcome to propose any kind of workshops on technics they wish to share. DJ set or live band every day at sunset. 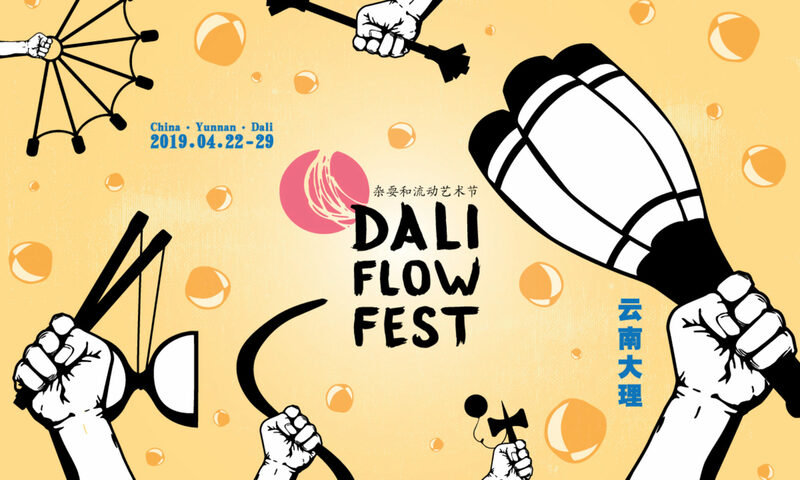 For it’s second edition, Dali Flow Fest will present 3 Shows and 5 Theme nights. Dali Flow Fest, it’s also 5 theme nights and fire circle every nights with live music and DJ’s. From the south gate head south until wenxianlou, turn left and left again here we are. – Many outdoor covered spaces for practice and workshops. – Camp site, showers, toilets, etc., will be available. – A community kitchen with vegetarian food at very friendly price, water on donation but also food stalls proposing all kind of veg and non veg , western and asian delicacy ! – Bar proposing local delicious brewed beer but also local pastis, gin, and a selection of arranged rhum … and of course some homemade soft drinks. ** The ticket price raise since last edition is only to compensate the free breakfast. we ll serve from 8:30 to 10:30 a very satisfying breakfast for everybody to start happily the day. ** Under 12 years old free !